¶ 1 Leave a comment on paragraph 1 0 Medieval manuscripts were made to be handled: to be read, to be touched, to be annotated, even kissed.1 Those fortunate enough to work directly with surviving written heritage continue to enact some of these physical reading practices in modern archives; augmented perhaps by modern interests in material philology and the history of the book, archivists, librarians, and researchers endeavor to unpick and decode the layers of textual and codicological evidence that make medieval manuscripts so fascinating. Never neutral carriers of text, manuscripts provide a window to the sociohistorical contexts in which they were produced, used, and abused.2 Manuscripts are complex objects; even if we—for one brief moment—disregard their individual, lived-object biographies, we are left with substantial data concerning their physical and textual contents. ¶ 4 Leave a comment on paragraph 4 0 Endres’s work on the first 3-D images of medieval manuscripts—now available for select folios of the St Chad Gospels housed at Lichfield Cathedral8—questions the implications for knowing when we view a digital manifestation of a manuscript, rather than looking at the analogue object. He asks, “What happens to our apprehension when a digital artifact has a vanishing point, a sense of open space filling in around it, when we can manipulate the perspective from which we view a digital artifact in countless ways?”9 Here, I would like to extend Endres’s questioning by arguing that cultural heritage custodians (including archivists, librarians, and researchers) with hands-on access may approach these material abstractions from an entirely different perspective of knowing than that of a member of the public, or a student or researcher without ready access to written heritage, for they have themselves handled—and thus encountered—the sensory experiences of medieval manuscripts in the flesh; they can identify where their (re)presentations of written heritage cease to effectively communicate the whole. But what of those audiences who may have never handled a medieval manuscript, never seen the play of light across an illuminated initial, or felt the texture of a piece of parchment between the fingertips? 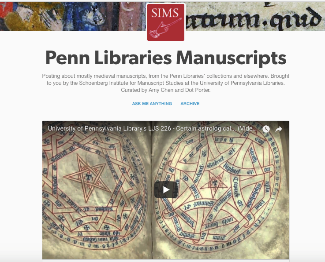 What of those students who may not have easy access to a medieval manuscript collection for hands-on learning or research? Do they experience these same material losses when viewing manuscripts in analogue or digital facsimile? Given the challenges implicit in offering these communities opportunities for hands-on learning with medieval manuscripts,10 how else might they engage with the materiality of the medieval book? ¶ 5 Leave a comment on paragraph 5 0 Of direct concern here are these differences in access between the academy (in which I include archives/archivists, libraries/librarians, and research/researchers with hands-on access) and the public (without).11 For those working within the academy who have hands-on access, there is potential for manuscript encounters to be both physical and digital: staff may make use of digital images of medieval manuscripts (where available) to aid research, but they may also make use of hands-on examination of their respective manuscripts. In either setting, these experiences with their chosen manuscripts are largely individual. They encounter the manuscript, or a digital manifestation of it, typically alone, one-on-one. Though these experiences are certainly mediated by the regulations of the reading room and the functionality of the digital viewer, these users control their encounters by choosing how they interact with the object in front of them, determining the pace of exploration—which page to open, when to turn, when to pause. However, for the public, physical vs. digital access is further complicated by the respective remoteness of the analogue materials; “physical” access for much of the public may only ever manifest itself as experiencing an open manuscript behind glass at best, rather than a hands-on experience that occurs one-on-one with a manuscript in an collection’s reading room. Indeed, due to manifold reasons including but not limited to cost and geography, manuscript exhibitions may only ever be accessed by a relatively small percentage of the public.12 This “physical” exhibition-centered encounter cannot be restricted to the individual, because the manuscript is on public display. Thus, a person’s experience of a manuscript is shared with whoever else may be visiting the exhibition at that time. The public’s encounters in exhibition spaces are inherently mediated and beyond their individual control: the manuscript is static and out of reach, the page chosen, and the interpretation limited. Additionally, these “physical” opportunities to encounter written heritage are not necessarily frequent. 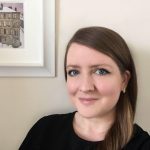 As a book historian, I am invested in regularly accessing exhibitions of written heritage but have visited only three “physical” exhibitions of medieval manuscripts in the past four years (The Lindisfarne Gospels, Durham Palace Green Library, 2014; Ingenious Impressions, an exhibition of incunabula at the University of Glasgow, 2015; The Celts, an exhibition including medieval manuscript items, National Museum of Scotland, Edinburgh, 2016). All but one required at least an hour’s travel and the purchase of a ticket to access. My argument here is that for the public, if they access medieval written heritage at all, their primary encounters are likely never to be hands-on and only occasionally occur within exhibition spaces; rather, they are more likely to be digital—the written past encountered online if encountered at all. ¶ 8 Leave a comment on paragraph 8 0 I here argue that digital material encounters enabled by social media platforms are equally worthy of analysis as cultural artifacts in their own right, while providing key points of public access to holistic written heritage. 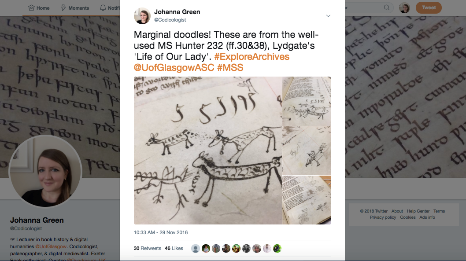 When written heritage is shared via social media, custodians are actively engaged in asking not only what the public want to access, but demonstrating how simple use of everyday digital media supports such access. 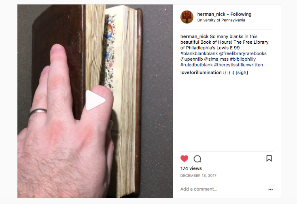 By focusing my attention on the social media platform Instagram, I contend that emerging trends in social media content relating to medieval written heritage invoke the presence of curatorial hands—both visible and inferred—which act as tactile and haptic intermediaries to materially disenfranchized audiences. 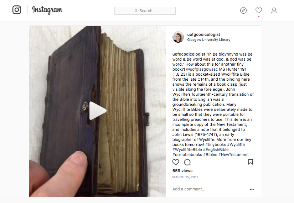 Thus, rather than functioning simply as digital facsimiles which, as Wilcox states, “fail[s] to engage senses other than sight,”19 Instagram allows curators to return the medieval manuscript, here presented in its digital skin, to a site of touch. 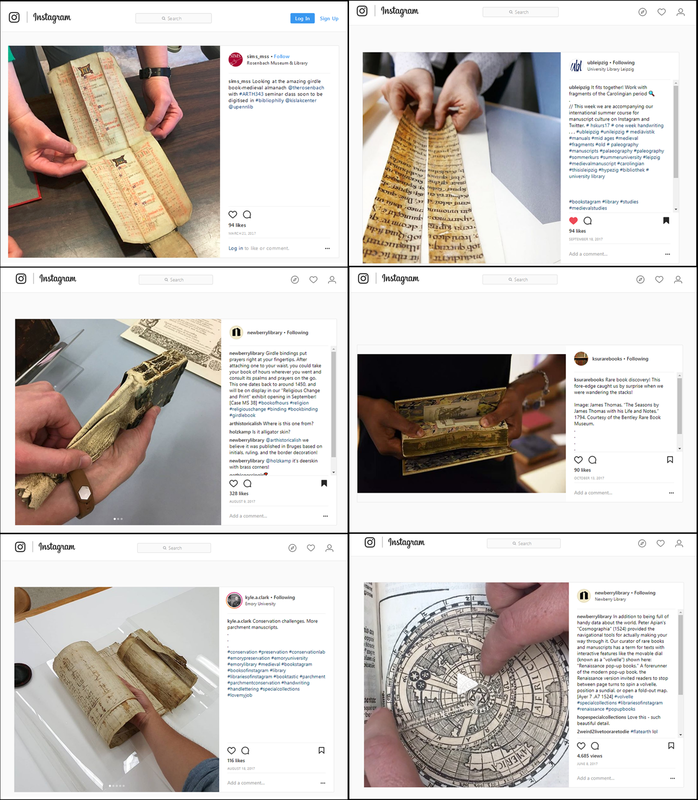 In so doing, their work provides a space in which a digital “hands-on” experience, comparable to hands-on learning activities within museum spaces, is made accessible from within medieval manuscript collections. ¶ 10 Leave a comment on paragraph 10 0 If we extend this process of remembering and connecting to medieval manuscripts, the material connection between object and audience is the physicality of the book. Even when the public cannot touch the items on display, the relative stability of the medium from medieval manuscript to modern printed book means the audience arrives at the object with a basic sense of knowing. While this knowledge may not extend to experiencing what the material of parchment feels like—though a piece of modern parchment might be offered as an interactive part of a physical exhibition—it does extend to what an encounter with a codex structure feels like. They are familiar, at least, with modern knowledge of the technologies of reading analogue materials. 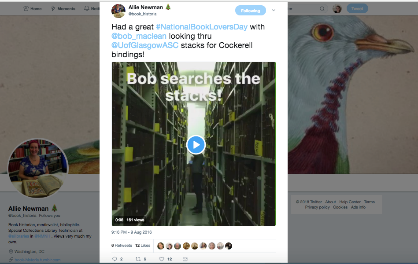 As artist Deidre Brollo describes, “While books also increasingly have a digital life, their strong presence as physical objects remains, and so too does our haptic engagement with them . . . handling a book continues to be a quotidian experience.”22 It is from this shared point of knowing that archives and special collections often work to publicize their holdings, to demonstrate the similarities of medieval books, their contents, their practices to modern reading, or to deviate from this shared knowledge—to challenge it and show how medieval manuscripts might involve surprising or unique reading experiences. The connector, here, is digital in the sense of the hand and the finger: with every book we encounter, hands are present, whether these are the hands of the manuscript producer in shaping the codex, the scribe in producing the script, the audience in making their marks in the margins, the hands of modern staff involved in the cataloguing and digitization of these materials, or the modern reader who presses their hands against the exhibition glass, touches the parchment with their fingertips in the reading room, or manipulates its digital avatar by tapping, clicking, or swiping. In presenting the medieval codex, we invoke the known acts of reading and codicological manipulation as a central means of communication, and meaning is made when we play directly with those quotidian experiences and expectations. ¶ 16 Leave a comment on paragraph 16 0 Thus, the manuscript image accessed via a digital viewer or via social media has only the potential for meaning production; it is via the acts of reading or other embodied individual experiences enacted or performed with that site that meaning might be made. In other words, our digital objects need to engage performatively with their user. 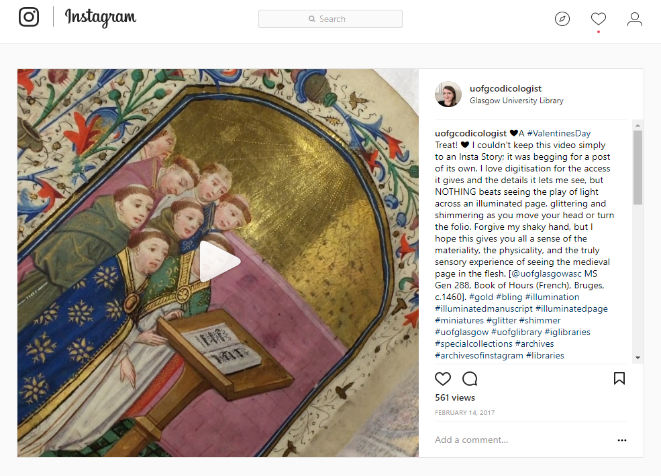 While one might argue that the addition of critical apparatus (digital tools for discovery, or interpretative notes and interactive commentary) might assist with such performativity when using a digital manuscript viewer, I here propose that social media, specifically the image-based platform Instagram, may be considered a radical place of performative engagement. ¶ 17 Leave a comment on paragraph 17 0 A key component of social media use by archives, libraries, and book historians is to exploit the functionality of these platforms to help “unlock the archives” and offer followers access behind the scenes, or to provide alternative views of items in their collections. ¶ 30 Leave a comment on paragraph 30 0 Indeed, with the ubiquity of touch technologies, social media is emerging as a transformative place for material engagement between holding institutions and their audiences quite simply because platforms such as Instagram exploit the importance of touch technology implicit in the digital devices used to access its content (i.e., inherently mobile devices such as smartphones and tablets). In the case of Instagram, this touch-based activity is marked, as it takes place most often on the image itself: users “double tap” the image to “like” (or “heart”) content. They swipe a finger back and forth across an image to reveal further content posted as a set; they touch images uploaded as a story (a video available either for twenty-four hours only or “pinned” to the head of a user’s profile as a “highlight”) to move the content along, they pinch an image to zoom, and they scroll profile archives and their home feed with their fingertips to reveal new content. Of key importance here is the centrality of the image to this activity: the image itself is the site upon which touch is focused. ¶ 31 Leave a comment on paragraph 31 0 Over the past two years or so, curators (by which I refer to librarians, researchers, students and anyone engaged in producing social media content involving medieval manuscript collections) have been exploiting the evolving capacity for touch-based interaction on Instagram, making increasing use of DIY digitization techniques to communicate the “bits of books” that traditionally remain unseen by many audiences, either because these audiences never have an opportunity to handle a medieval manuscript in the flesh, or because the details captured by personal images reveal information not accessible via the professional digitized image.35 These posts capitalize on the audience’s materially disenfranchized desire to touch (something that they are traditionally prohibited from doing) by making use of the platform’s touch-based processes for interaction in combination with another means of connection between audience and, as Theisen calls it, the “long arm of history”—the presence of curatorial hands. ¶ 35 Leave a comment on paragraph 35 0 Both visible and inferred, these curatorial hands and fingers serve to connect the audience to the object in a more haptic and engaged manner that is currently possible via a digital manuscript viewer. 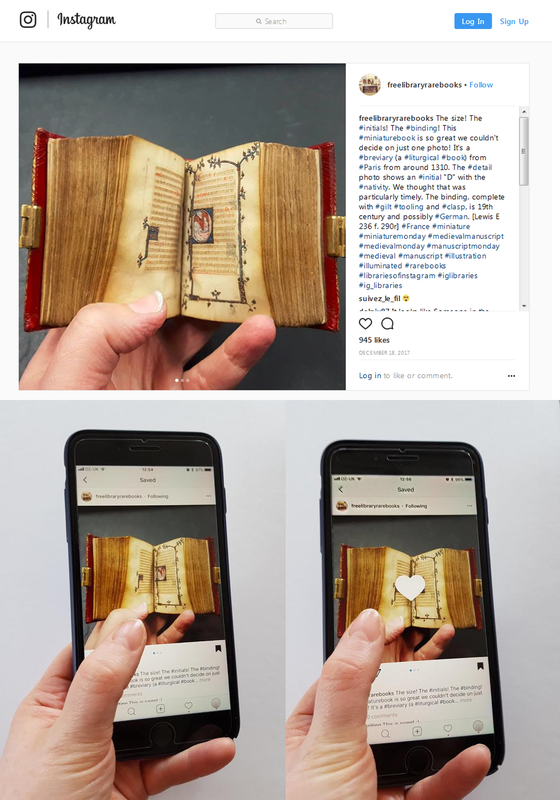 The manuscripts are no longer disembodied by the digital skin they wear but are enlivened by the hands that manipulate them for the Instagram audience. By using theorizations of the aura of the original object/image by Barthes,36 the reproduction of the object by Benjamin,37 and the sensory connections between object and audience by Brollo38 respectively, I here argue that Instagram provides users with a digital “hands-on” experience of medieval manuscripts, one that offers a significantly different encounter and experience than that of a digital manuscript viewer or in a traditional physical exhibition. 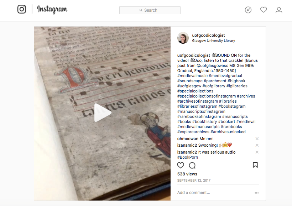 Just as Kim argues the medieval manuscript is better understood as a mise-en-système than a mise-en-page—that is, a site of interaction, recreation, and reinterpretation—so we might better understand the digital manuscript presented via Instagram, as a site for engagement, exploration and, crucially, touch. 39 Thus, though the platform has visual content at its focus, its communicative offerings are not simply ocularcentric; it is digitally haptic. ¶ 43 Leave a comment on paragraph 43 0 This bodily connection is further strengthened by the presence—both visible and inferred—of curatorial hands that manipulate the manuscript “body” for photography, whether static or moving image. ¶ 51 Leave a comment on paragraph 51 0 Curatorial hands thus play a central role in communicating the whole book, or the plenitext, to materially disenfranchized audiences; this content assists audience engagement in actively re-enacting the gestures of book manipulation and of reading. 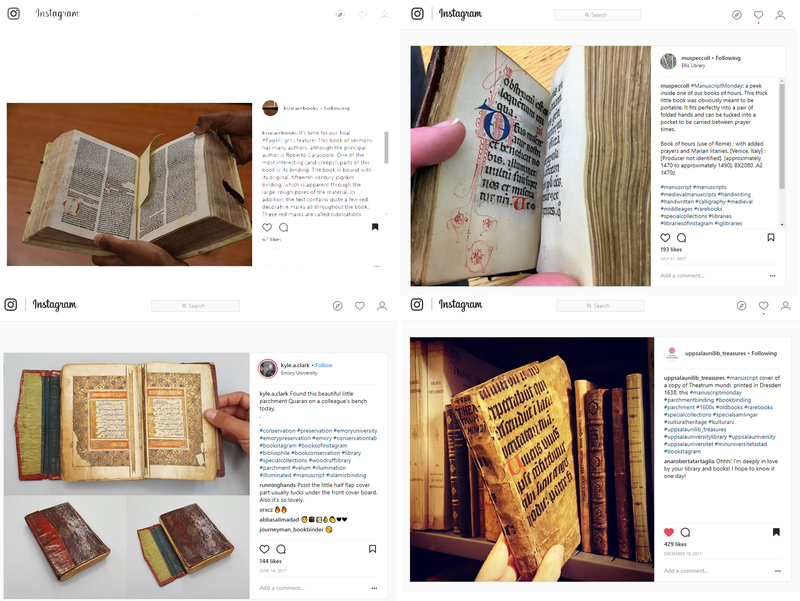 The visual examples included here demonstrate the connective presence of curatorial hands as visible intermediaries in Instagram content of medieval manuscripts. They provide scale via which the original object may be compared, they hold open a manuscript enacting the handling processes of the original object, and through each example they actively touch the page, providing a haptic point of connection between viewer and digital image.48 The images provided here demonstrate how the audience is invited to do the same with the digital image: to place their fingers over the curators’, to imitate and re-enact the handling demonstrated onscreen, and to use their hands to manipulate and interact with the digital object in front of them via the means of engagement described above. ¶ 66 Leave a comment on paragraph 66 0 Thus, the variety of visual, haptic, and even auditory description permitted by the above approaches allows for the creation of digitally enabled explorative and interpretative spaces for the consumers of this media. 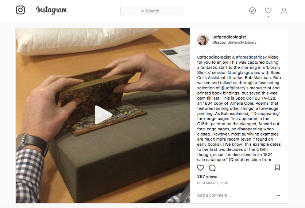 By unlocking manuscript collections in this manner, social media has enabled cultural heritage custodians to augment the meaning-making experience of encountering a manuscript as a 2-D digital image in a digitally performative, fundamentally materially-orientated space. In Time Binds, Elizabeth Freeman argues for “an affective historiography” that is fundamentally “digital” as it relies on the senses—touch in particular—as a methodology or a means of encountering the past, creating generative connections between past and present.55 Thus, by offering a space for “hands-on” encounters with materially inaccessible objects via social media, curators communicate medieval manuscripts as dynamic objects, texts, forms of technology, and works of art. Most importantly, however, they offer up our written heritage as sites that permit, encourage, and are oriented around touch. In that sense, our manuscripts—through their digital skins—are once again made flesh.